Some episodes of television tip you off to how good they’re going to be from the very first shot. Others, like “June 13th, Part 1,” tell you to sit back, buckle up and pay attention with its music, whether it’s a needle drop of a Top 40 hit or a special piece composed score. The opening shots of the Odessa festival stick in your head because we’re hearing something that’s been noticeably absent through Heroes Reborn up until now. This really felt like the first time since at least “Odessa” that the talents of Lisa and Wendy have been on full display. It was jarring to hear the “Peter Petrelli” theme at first. But by a certain point it was jarring not to hear music in the few scenes it wasn’t present, as when Luke is talking to Joanne in the medical tent. But the return of the music that defined the first season of Heroes is more than appropriate for “June 13th” which gave us our first significant dose of show’s roots. We get Angela Petrelli talking about visions. We once again get the sweet, soothing sounds of Mohinder complaining about his research. With the direction of series veteran Allan Akrush, who helmed “Six Months Ago,” “Company Man” and “How to Stop an Exploding Man,” the episode feels like it could easily have been a part of the original run. Akrush brings a lot of personal touches to it that the last three to four episodes felt pedestrian without. This episode just felt right. Except where when the Evermore storyline had to make an appearance. The scene with Hiro and Miko’s dad/creator slowed down the pace of the episode even though it’s necessary to explain…well, actually it isn’t necessary at all, is it? We were basically told what happened in “Game Over.” We didn’t need to see it. Other than that, this was the most streamlined Chapter yet of the season. Kring and Co. put a lot of effort into it and it showed. We’re being fed so many answers and good material that I didn’t even recognize Nathan’s stepmom was the nurse that brought Noah and Angela the babies until the closing scene at the house. It culminates in an incredibly natural conclusion to an episode of Heroes. A cut to black that made us want next week’s episode to get here as soon as possible. Is Mohinder dead? We never see him die. For some reason I assumed Mohinder had lost his abilities. I’m sure I wasn’t the only one who experienced flashbacks to the Bug saga. I bet I’m the only one that picked up on the “San Francisco” bit being a reference to Indiana Jones and the Kingdom of the Crystal Skull. The scenes with Phoebe in the compound under the house are odd if you take into account the Dark Matters digital series, which showed a news report with her clearly present with Erica and Harris AT the festival. I really like the visual of Noah and Casper “Penny Man” Abraham as partners. They both look like they should be in a 50s noir film. Maybe Hiro shouldn’t yell when he’s about to attack someone. Seems like a bad tactic all the way around. If “Brave New World” and “Odessa” was the first glass of water we were given after five years wandering the desert, “Game Over” might as well be the first glass of lemonade after an unreasonably long summer. Forget the first appearance of Masi Oka as Hiro Nakamura since the conclusion of the original series on Feb. 8, 2010. For a moment, forget the first direct reference to Isaac Mendez and the “9th Wonders” comic book series. What made “Game Over” feel like vintage Heroes was in the editing, the direction of Gideon Raffand and the writing of Nevin Densham, who scribed only his third episode of television in four years. From the first shots of HRG interrogating Harris (prime) via pool and Carlos doing the same to Captain Dearing with his bare fists to HRG and Hiro walking into the Odessa Summit on June 13, we’re finally treated to the first riveting, attention grabbing hour of Heroes Reborn in four weeks. The new (used) car small wore off after three episodes and that’s around the time the stakes of this potentially one-off season should have been established. However, the impending danger of a solar flare wasn’t made clear until “The Lion’s Den” and now the show can shift into a higher narrative gear. What was really missing from the first five episodes were the seemingly random connections made between story lines as characters passed each other in the night or linked up for a story arc. HRG/Quentin and Miko/Ren don’t count, they were both aimed for Renautas and it was inevitable their paths would cross. When they did, it made for the best 15 minutes of the show since HRG and Quentin went crawling through the remains of Primatech. But Luke and Malina? Two characters with completely different objectives and paths winding up at the same marina felt almost natural. But when Malina pulled Tommy’s (Nathan?) photo out of the blood stained envelope, it felt downright blissful. This triumvirate was not one I would have easily predicted a week ago, let alone three. But pairing the character once hell bent on killing any EVO in his path with the two characters the fate of the world is seemingly linked to now seems obvious. 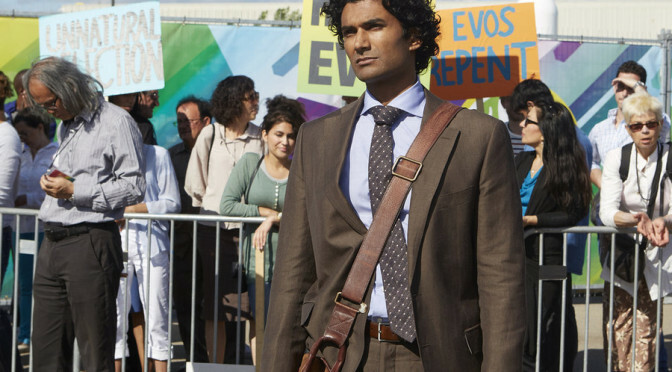 After six episodes, the only aspect of Heroes Reborn that hasn’t felt natural or obvious narratively is Carlos. He’s still completely isolated from the rest of the series and more than likely will be sidelined until after the “June 13th” two-parter. I’d rather that be the case than him being shoehorned into either episode. But I’m willing to forget about Carlos for the next two weeks as Hiro and HRG try to put right what once went wrong. It might lead to a horrible time travel induced headache, but I want to believe HRG was speaking for Tim Kring when he told Hiro he had a plan. If the “June 13th” episode description didn’t tell us “Miko’s” father was in the episode, this week would have felt like a natural ending to her storyline. But it would have felt awkward not have met Hachiro Otomo at least once this season. Unless time travel changes it, I really hate that we’ve been robbed of the terrific HRG/Quentin dynamic. It was by far the perfect pairing through the first six episodes. But the “buddy” reference was a touching note to end it on if it really is the end. I’m probably wrong, but aside from Charlie and Ando in the original series, I think HRG is the first character to time travel with Hiro. The first “Leroy Jenkins” joke was amusing, the second one was adorable. That deserves a hat tip. In the promo for “June 13th,” I can’t decide if Hiro saying “This time you save the cheerleader, I’ll stop the bomb” is a reference to the first season of the original series or how things originally played out in Odessa a year ago. Malina and Tommy (Nathan?) are twins. If not, I’ll donate $10 to the charity of choice of the first person that calls me out on it on Twitter. NBC has released an official description for the November 29 episode of Heroes Reborn, which brings back more favorites from the original show. HEROES FROM THE PAST COME TOGETHER TO SAVE THE FUTURE – MASI OKA, SENDHIL RAMAMURTHY AND CRISTINE ROSE REPRISE THEIR ROLES – FRANCESCA EASTWOOD, CLE BENNETT, AISLINN PAUL AND PRUITT TAYLOR VINCE ALSO GUEST STAR – In an effort to get answers, Noah Bennet (Jack Coleman) joins forces with Hiro Nakamura (guest star Masi Oka) to return to the day of the tragic events of June 13, 2014 that set everything in motion. On the verge of delivering a speech to commemorate the event, Mohinder Suresh (guest star Sendhill Ramamurthy) receives a dire message from Angela Petrelli (guest star Cristine Rose) about Erica Kravid’s (Rya Khilstedt) true motives. In Japan, Hachiro Otomo (guest star Hiro Kanagawa) makes a calculated move against Hiro Nakamura. Meanwhile, a much happier Luke (Zachary Levi) and Joanne (Judi Shekoni) come to Odessa in hopes of finding a cure to their son’s ailment. Robbie Kay also stars.